I admit it. 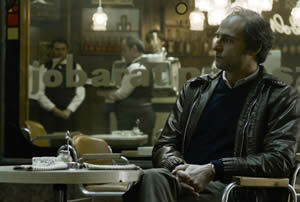 I sometimes became confused watching Tinker, Tailor, Soldier, Spy, a big-screen adaptation of John Le Carre’s 1974 novel. Frustrating? Yes, but there also were times when I found the movie so atmospherically right I didn’t care whether I could dot every “i” or cross every “t” in Le Carre’s labyrinthine plot. A bit of background. Dense with character and incident, Le Carre’s novel does not naturally lend itself to adaptation. In 1979, it took the BBC seven episodes to translate Le Carre’s novel into a comprehensible drama. The great Alec Guinness starred as George Smiley, the world’s least emotive spy. Those familiar either with the novel or the BBC series immediately will know that screenwriters Bridget O’Connor and Peter Straughan faced a monumental task. Fair to say, they haven’t entirely succeeded in taming Le Carre’s novel. But in the case of Tinker, Tailor, mood and background may be as important as a plot that, in its overall arc, is easy enough to follow. Here’s the gist: We’re nearing the end of the Cold War. The British intelligence agency – known to its employees as The Circus – is in the midst of a power shift. A group of rebellious spies is trying to unseat the agency head, known as Control (John Hurt). They succeed in ousting Control, and his most reliable operative, George Smiley (Gary Oldman). Control subsequently dies. All of this turmoil begins when Control initiates a search for a mole who has penetrated the highest levels of British intelligence. In keeping with the feeling of institutional decline, Tomas Alfredson — who directed the terrific Swedish vampire movie Let the Right One In – gives the proceedings a bracingly severe tone. From the start, it’s clear that Alfredson has total command of the movie’s look. Following the story isn’t made easier by the fact that the screenplay employs a flashback structure that can be disorienting. And the screenplay’s refusal to explain any of its spy jargon doesn’t help either. But I doubt whether you’ll find a better supporting cast in any movie this year. Populating the spy ranks are intelligence bureaucrats played by Colin Firth, Ciaran Hinds, Toby Jones and David Hencik, all of whom are superb. And in Hurt, Alfredson has found an actor whose weathered face does as much to suggest institutional collapse as any plot developments could. Hurt crops up at the beginning and in some flashback scenes, and he gives the movie a cynical weight that’s indispensable. Then there’s Oldman, whose restrained performance as Smiley has been praised in the British press and elsewhere. To play Smiley, Oldman slows his delivery and explores the lower octaves in his vocal range. He can be brilliant. A scene in which a drunken Smiley reenacts a long-ago interrogation of a top and much-feared Soviet agent delivers the goods, and is punctuated by Oldman’s slight wobble when Smiley finishes his story and attempts to stand up. But there are also times when Oldman’s restraint seems to lack resonance. Smiley has been through a lot. His wife Ann (never seen in full view) has left him. He has endured the endless sordid battles of Cold War spying. He’s been pushed aside by the agency that has dominated his life. He’s hardly the kind to vent: Still, I found myself wishing that Oldman had taken us a little past Smiley’s purposefully blank expressions. Maybe Oldman, who functions as the story’s principal investigator, didn’t want to take anything away from his fellow actors. In a scene in which George meets with Connie Sachs (Kathy Burke), a former intelligence emplyee, Oldman watches while Burke creates a telling portrait of a woman whose romantic impulses were channeled into admiration for her co-workers. It’s a great small piece of work. Although it falls short of perfection, and although, as I’ve said, Tinker, Tailor can be confusing, it always feels intelligent, partly because of Alfredson’s skillful direction and partly because there’s not an actor on screen who doesn’t seem smart in some way. Tinker, Tailor includes sexual betrayals, references to torture and fierce intra-agency battling, but instead of going for cheap thrills, the movie immerses us in a world-weariness that fits its historical moment. Alfredson may not fret about whether viewers sink or swim with the plot: But surely he wants us to swim in the same murky waters in which the characters bob, looking for something to grab hold of.